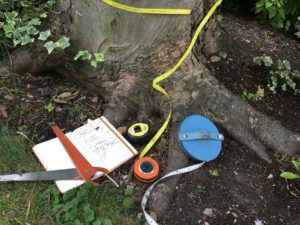 Our Tree Surveys are carried out for a Single distinct purpose. To provide the basis for maintenance and management of trees, be it a single specimen, group or entire woodland, a tree survey is usually required to determine the condition and quantity of the trees as well as the needs of both the trees and their owners. Our surveys are tailored to suit the individual needs of the customer and their property with accurate tests using the Arborcheck system, to assess the trees vitality alongside tomograph/resistograph testing to assess the structural condition, so that an informed decision can be made on any necessary works, be it retention or removal. This information is commonly used to support Tree Preservation Order applications and is classed as supporting evidence that is required for the application to be valid. We also take soil samples to determine soil make up and for nutrient testing, while ph tests are carried out on site. Soil testing can provide a wealth of information and when combined with the Arborcheck system, many issues can be spotted long before they become visible to the eye, and a plant health care plan can be put into place to remedy these issues and ensure the long term health of your trees. In the case of a tree survey for proposed development, we collect the information deemed necessary in British standard BS5837:2012 Trees in relation to design, demolition and construction-recommendations, and use this to produce the necessary tree retention/removal drawings to go alongside the Arboricultural Impact Assessment and help prevent any unnecessary tree related issues arising during your development. When required aerial inspections can be carried out alongside your tree survey. These can spot potential defects not visible from ground level, and are carried out by either traditional rope and harness access, mewp or drone.